For the first time, the Dark Knight faces off against the ultimate other-worldly enemy in the Eisner Award-winning miniseries, DC COMICS/DARK HORSE COMICS: BATMAN VS. PREDATOR by Dave Gibbons (WATCHMEN), Adam Kubert (SUPERMAN: LAST SON) and Andy Kubert (DARK KNIGHT III: THE MASTER RACE). While fear and darkness have always haunted the streets of Gotham City, a new terror has crept onto the rooftops and into the hearts of its citizens. 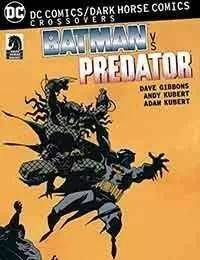 An alien hunter known only as the Predator has come to Gotham to hunt its greatest warriors, and after a string of brutal murders, the Predator has its sights on Batman. In an epic showdown, the Dark Knight must use all of his skills, both martial and mental, to beat this otherworldly menace.